The mighty sump pump keeps your basement dry by pumping out groundwater that collects in the pit. You'll hardly think about your sump pump until it's too late. If your sump pump fails during a big rain event, your basement can flood causing extensive damage to your valuables and appliances, not to mention the huge mess it'll create. Learning how to get the right sump pump for your home is one of the best things you can do to protect it before you're in trouble. Primary sump pumps are the standard pumps found in many residences. Designed to pump seepage water out of your basement, they prevent floods. They can pump up to several thousand gallons an hour to keep your home safe and dry. 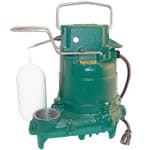 There are two types of primary sump pumps: submersible pumps and pedestal pumps. Submersible pumps are put underwater in your sump pump basin, while pedestal pumps are positioned with the pump motor out of the water, above your sump basin. Pedestal pumps are best for small basins, as the pump base is submerged but the pump motor is not. Battery backup pumps provide you added insurance in the case your power goes out. As sump pumps are electric-powered, they can be rendered useless in a power outage, which is usually when you need them most. The battery backup unit is not only used in the event of a blackout but also if the main pump fails for any reason or cannot keep up with the demand during a large rain event. In the event of a power outage, the battery on the backup unit will kick in providing the pump with power so it continues working, even without regular electric power. New technology allows some of these pumps to even text or email you in event of a failure. Pro Tip: Don't be confused by the term "back-up". Some sump pumps might be labeled a "back-up", but that doesn't mean they will work during a power outage because they are still a/c powered and will not work with a battery. Make sure you get a designated "battery back-up" system instead. Combination sump pumps are just that; a combination of a primary pump and a battery backup all in one package. If you've ever dealt with the aftermath of a flooded basement, you know exactly how painful that process can be. With a combination sump pump, you are protected under normal circumstances and in power outages as well. Besides flood insurance, this is the pinnacle of home flood protection. The backup pump will also kick on in the event the primary pump cannot keep up with the water as it enters the basin. Sewage pumps aren't like traditional sump pumps, although they could be used for this purpose. Rather, sewage pumps are primarily designed to pump sewage waste and effluent from a home to a septic system. Sewage pumps can pass solids up to 2", which is one of the biggest differences between them and regular sump pumps. Once installed, sewage pumps run automatically. They can either be installed in the septic tank itself, or in a separate pump chamber. Sump Pump Buyer's Guide.. Our Power Equipment Direct how-to library can help you learn about Proposition 65 Product Labeling, Introducing Barnes Sump Pumps and Sales Tax Information.